We already know that apples, pineapples, oranges, and even blueberries are incredibly tasty treats for your pooch – but can dogs eat strawberries and enjoy one of the most romantic fruits without getting ill? I’ll ease the minds of all of you strawberry lovers. YES, you can feed your furry friend tasty, fresh strawberries, and they’re even incredibly healthy! Some fruit isn’t very suitable for dogs. Grapes and raisins can be toxic, while cherries, plums, and peaches have pits that can be a choking hazard. Fortunately, strawberries have none of that! They’re not only jam-packed with deliciousness and freshness but are also full of healthy, beneficial vitamins. When introduced carefully and slowly, they can be a great addition to your dog’s diet. This guide will outline all the benefits of feeding your dog strawberries and advise on the best way to prepare the most-loved berry for your pooch to enjoy. Strawberries have a great deal of health benefits for people and the same goes for dogs! A single strawberry is full of beneficial vitamins, minerals, and other nutrients. Potassium, magnesium, folic acid, fiber, omega-3 fats… the list goes on and on! Another health benefit of strawberries for dogs is that they’re extremely healthy when served fresh. They can help with aging and weight management, as well as strengthen the immune system. Besides, as we all know, strawberries are a delicious treat. 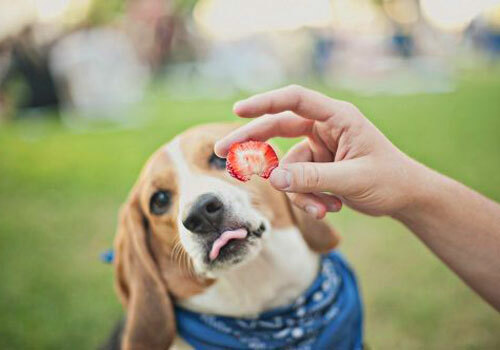 Therefore, if your pooch has a sweet tooth, you can treat them to a strawberry without worrying about their health! They are an excellent low-calorie sweet snack for dogs, especially considering other fatty treats that are out there! Strawberry contains an enzyme that can whiten your dog’s teeth, so your pooch has the brightest smile of them all. They are very rich in folic acid, or vitamin B9, which helps red blood cells in the bone marrow divide. Strawberries have a hefty supply of omega-3 fats which bring numerous benefits for your pooch, such as improving their coat, fighting arthritis and other infections. These are all reasons why you should consider strawberries as a sweet, fresh treat for your pooch. Remember, since dogs don’t really take well to sugar, there isn’t a lot of sweetness in what they eat! You can change that with strawberries, as long as it’s not excessive. Of course, when considering adding strawberries to your dog’s diet, you should go by the two golden rules of canine food – everything in moderation and, if possible, consult a vet beforehand. There are so many different allergies out there and, you never know, maybe your pup doesn’t take to strawberries that well! Too much is never too good when it comes to anything, so always make sure to regulate your pooch’s portions! As a rule of thumb, half of one strawberry is good for a treat. 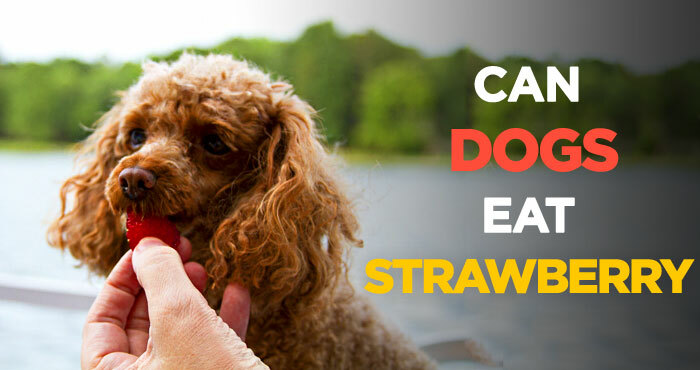 To sum it up, strawberries have a ton of nutritional benefits and are also incredibly tasty, so your dog is sure to enjoy their newfound treat! Why Are Strawberries Bad For Dogs? While strawberries can be really beneficial to your dog’s health, they also hide some risks that all dog owners should be wary of. First of all, even though all the sugar in strawberries is natural, it’s still sugar. Too much of it is never good, as your pup might end up gaining a few extra pounds. Besides, too much sugar can also lead to a fussy stomach. To add to that, too much potassium isn’t too good either – it can interfere with your dog’s thyroid function. That’s why it’s always best to watch the amounts of strawberry you allow your pooch to eat. You have to be strong, resist the power of the pleading dog eyes and not let your puppy stuff their face with the stuff, as they (and you) will regret it later. 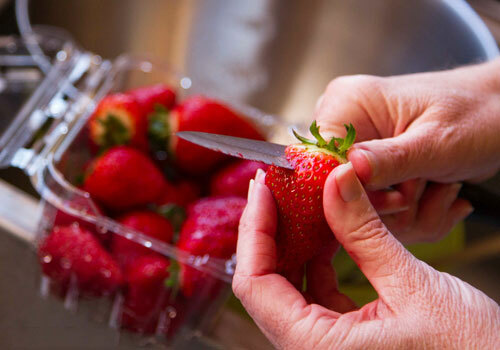 Like with other fruits, strawberries can be a choking hazard when not chopped or they have any stems or leaves left on them. Closely observe your dog after giving them strawberries for the first time. Some pups exhibit signs of allergy almost instantly. If that happens, don’t give them any more strawberries and consult a vet. Any occasion in which the strawberries haven’t been either freshly picked from the garden or bought from your local farmer’s market should be avoided. The best sweet strawberry treats for your pooch are fresh, cleaned, washed strawberries. Canned strawberries, as well as strawberries doused in syrup, are a big no-no. Same thing goes for any strawberry-flavored chocolate, or strawberries with cream. You wouldn’t normally feed your dog these things because of their high content of processed sugar – the strawberries don’t make it any better! You shouldn’t worry too much when you decide to add strawberries to your pup’s diet, but always exercise caution. Unlike other foods, overdosing on strawberries isn’t that dangerous as it leads to a few days of unpleasant diarrhea. 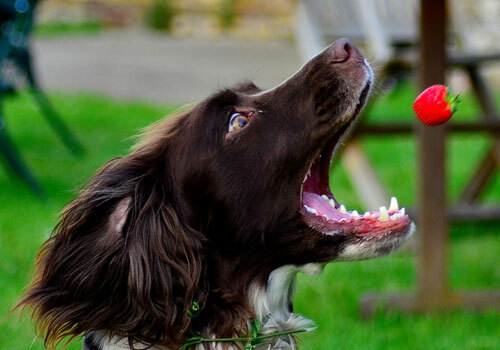 To avoid this experience for your pup, always be mindful of the quantity of strawberry and the way you’re serving it to give them a fantastic strawberry experience! How to Prepare Strawberries for a Dog? 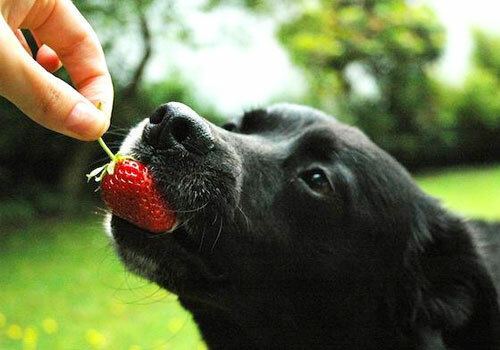 As mentioned before, fresh strawberries for dogs are always preferred as a treat. Growing strawberries in your garden? Chances are your pup’s sniffed them out already! Now, the dark side of any strawberries is that they’re sprayed with a lot of toxic ingredients to keep them safe from pests. 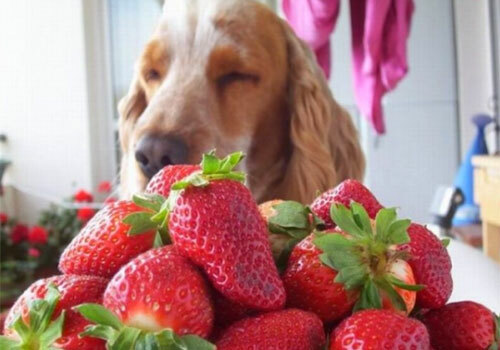 There’s an easy fix for that – always thoroughly wash and rinse the strawberries you serve your pup! You would do that for yourself too, so why not do it for your best furry friend? Another safety precaution to take before giving strawberries to your pooch is to cut them into smaller pieces, so that they can digest them more easily. Uncut strawberries are an easy way to cause belly troubles. Many dog owners like mashing strawberries. This works particularly well for pups, especially if you mix them with their food! It makes it a lot easier to digest all those healthy ingredients. Although mashed strawberries are good, strawberry-flavored things should make a red alert sound in your head. We know that a lot of things are strawberry-flavored these days, and it might be tempting to give them to your pooch – don’t! The strawberries have lost all their nutritional value, and you’d only be giving your dog processed sugar, which is really unhealthy. Forget chocolate and yogurt; only give your pooch the real thing. Finally, any leaves or stems left on the strawberry should be carefully removed before feeding your pooch as they also carry some of the toxic spray ingredients but are impossible to wash.
My Dog Ate Too Many Strawberries! What to Do? Dogs can only enjoy the health benefits of strawberries if they eat them in small quantities. Too much strawberry means a 99% guaranteed stomach ache. 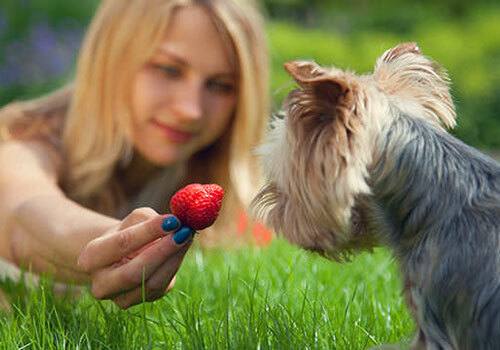 Always introduce strawberries gradually to your dog’s diet and closely monitor their reactions. Some dog breeds are more susceptible to strawberry allergy. Ideally, always consult your vet beforehand! But what do you do if your dog found your strawberry stash and gorged on them? Don’t be surprised by the stomach upset that results. The levels of potassium and natural sugars will lead to vomiting and excessive bowel movement. That’s a good thing, as it’s showing your dog’s body is trying to cleanse itself. If this goes on for longer than a week, consult your vet immediately. And, while it might be common sense, don’t feed your dog any more strawberries for a while. Contain your pup in an area that’s easy to clean. Monitor their eating habits closely after the incident, as you want to make sure there’s no long-term damage. Fresh air and regular walks really help with recovery and your pooch’s water bowl needs to be readily accessible as well. Fortunately for dog owners, overeating strawberry doesn’t have a fatal effect like other fruit might. Sure, it’s going to be unpleasant, but ultimately they can’t cause any serious problems. That’s a lot of strawberry talk! If you’re still in doubt as to whether to feed your pooch some strawberries, I’ve summarized the article in a few frequently asked questions below. Feel free to pop any queries that have remained unanswered in the comments below! 1. Can dogs have strawberries? Are strawberries safe for dogs? YES! They are a nutritional powerhouse, and they’re perfectly safe to feed to your pup. Strawberries are not only extremely delicious, but also rich in vitamins and minerals that keep your pooch healthy. They benefit immune system development, bone tissue, muscles, and digestion. Plus, they’re a great, quick treat for any pooches with a sweet tooth. 2. Can dogs eat wild strawberries? Are wild strawberries poisonous? Wild strawberries are fresh, so they are the perfect pick for your pooch. Always make sure to wash and clean them thoroughly, though, to ensure that no toxic ingredients that they’ve been sprayed with remain on them. As well as rinsing them, clean them off any leaves or stems before serving them to your dog. 3. Can dogs eat strawberry chocolate? Can dogs eat strawberry yogurt? Despite the absolute abundance of strawberry-flavored substances in supermarkets, they’re actually very bad for your dog. The strawberries in them have lost all their nutritional value and the natural sugars, normally found in strawberries, has been replaced with processed sugar, which can be incredibly bad for your pooch. 4. Can strawberries cause diarrhea? Like any food given in abundance, diarrhea only comes when your dog absolutely gorges on strawberries. An upset stomach can come up if your pooch has ravished your strawberry garden. If that happens, you’ll just need to wait it out. To avoid, give your pup strawberries in halves or small pieces. Another solution might be to mash strawberries with your pooch’s favorite food. 5. Are dogs allergic to strawberries? 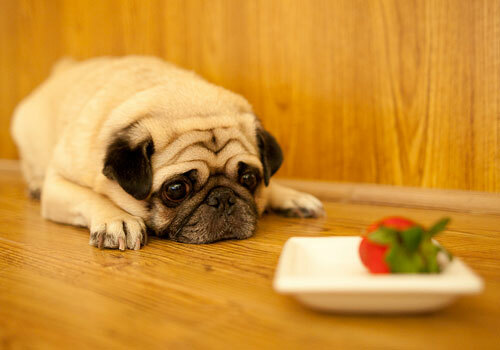 Some breeds might be – always consult a vet before adding strawberries to your dog’s diet. Typical signs of allergy are a decreased appetite for other foods, lethargy, and vomiting. That’s why you need to closely observe your dog after integrating strawberries in their diet. Always take it slow and perhaps mix small amounts strawberries with their normal food to see how they take to it. 6. Are strawberries poisonous to dogs? No! No part of strawberries is poisonous to dogs – under the strict condition that they’re washed and rinsed properly. 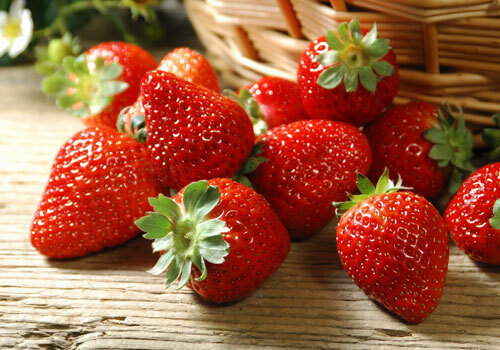 Some strawberries can be sprayed with toxic ingredients to ward off pests. If they find their way into your dog’s belly, they can cause some serious trouble. That’s why you need to always thoroughly wash the strawberries you serve your pooch, and remove their leaves and stems as well. 7. Can puppies eat strawberries? Yes – as long as they’re mashed. Puppies under 6 months of age should always stick to their vet-approved puppy food. However, if you do want to introduce strawberries to their diet, take a small amount and mash them thoroughly to make sure your puppy can digest it easily. As with most puppy nutrition, it’s always recommended to consult a vet before making any changes to your puppy’s diet. Strawberries are the signature food of romance. They come in all shapes and sizes and are always absolutely scrumptious. Dog owners have most likely asked themselves more than once: can dogs eat strawberries? This guide has shown that the answer to that question is definitely YES! Strawberries bring a lot of health benefits to your pooch and allow you to give them sweet treats on a romantic evening. As with any other food, they need to be given to your dog in moderation, as too much will upset their stomach. 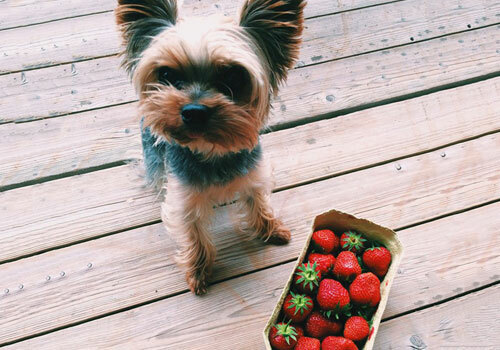 Despite that, strawberries help with your pooch’s immune system and bone structure. They can also whiten their teeth, so that your dog has a celebrity smile! Strawberries can be chopped up into tiny pieces or even mashed with your dog’s favorite food so that they still get all the nutritional benefits! Avoid strawberry-flavored chocolate or strawberries with whipped cream. The added sugar will only make your dog sick. Fresh, thoroughly rinsed strawberries are always the best pick for your pooch. 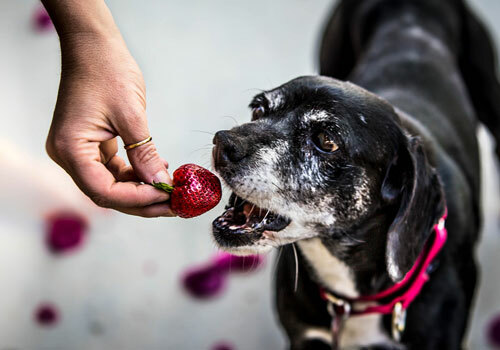 All dogs with a sweet tooth will rejoice at a strawberry treat and with the right amount of caution, those healthy, tasty berries will only benefit your best furry friend.